Containment Protocols: RPC-031 is to be confined within a standard 6.1 x 2.6-meter intermodal storage container at the site: ██████-██. No personnel under Level 2 Security Clearance are to be allowed to observe or handle the subject. No electronic device capable of interacting with a standard ink printer is allowed within thirty meters of the contents held within as a safety precaution, as the range of its anomaly is not yet known. Description: RPC-031 is by all appearances and evidence a seemingly normal office utility multi-function printer/copier. The materials and construction of the unit are not congruent with any particular brand or model of any known hardware but does fall in line with the standard design of early-2000's office printers. The unit measures 1.39 meters tall by 1.23 meters wide and weighs approximately 77.1 kilograms. When RPC-031 is plugged into or placed within an unknown range of a computer unit capable of interacting with a printer, the software will make no effort to detect the device or install drivers on the host computers. Searching through connections will not reveal RPC-031, the connection is only revealed when attempting to print a document or image, where it will be displayed as an option showing a mass of dead pixels regardless of the software used to reach the printing process. 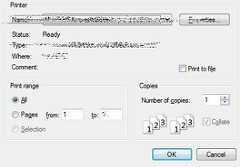 Other options and connected printers will no longer permit the option of printing through previously connected devices, any attempt to continue with another piece of hardware will result in an error message stating [REDACTED]. Printing standard text documents from RPC-031 results in no unusual behavior. The unit does not appear capable of running out of printing ink, though it does require insertion of foreign paper. Due to the inability to connect properly with RPC-031, there is no way of displaying ink levels without a program capable of displaying them during the printing process. If this is achieved the levels will vary heavily between repeated observations. Sometimes even appearing as completely empty yet giving no error when the printing process is started and will complete as per usual with no ill effects. The anomalous properties of the object surface when attempting to print images from the host computer. Images containing inanimate objects or fictional beings show no issue, however, if an image selected is a photograph that contains real living beings, animal or human; the printer will stall. This creates a loud noise described by Class-E personnel as [REDACTED]. Recording of RPC-031, heavily edited to remove neurological dangers. Once the process has finished, the printer will exude a wet piece of paper thoroughly soaked in black ink, most of the image will be recognizable however any area where a living being is present will be reduced to a deformed stain only vaguely resembling the subjects. Any output from the printer is labeled as RPC-031-1 from this point onwards. 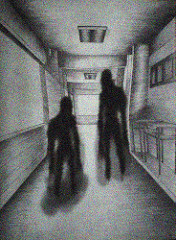 Any subject captured in the images used in RPC-031 that is processed through the hardware; whether through scanning or printing will [REDACTED] no matter where they are so long as they are still alive at the time of action, it is not currently known what happens to victims of the procedure. Returning to the site where the original photograph was taken will result in the observation of entities known as RPC-031-2. The environment of the scene will not be affected, however; matching their positions as designated within the printed image, formations of RPC-031-2 will hold their place. The appearance of these entities is described as conglomerations of wet printing paper and masses of black ink. These formations can be destroyed and moved but will slowly return to their initial state through means of unknown propulsion. The composition of the scene will not be affected by constructs or beings that were not present in the original picture, RPC-031-2 will simply form in any empty space still present, testing has shown that the constructs are capable of slowly moving loose objects preventing them from achieving their position. After approximately 3-4 hours, the entities formed will begin to create a noise identical to that created by RPC-031 during the printing, rising in volume over the period of 12 hours until it reaches upwards of 130 decibels, upon which the constructs known as RPC-031-2 will dissipate into mere puddles of ink and paper. Once this has occurred, the individual that initiated the print will now begin to display signs of serious paranoia and anxiety. Those questioned claiming that they can see wet apparitions stalking them. Outside observation reveals nothing, however, descriptions match those of RPC-031-2 prior to their dissolution. It is unknown if these are the same entities that formed previously. Subjects targeted often attempt to flee their unseen pursuers however it is not known what their behavior patterns are due to the inability for bystanders to see the apparitions, or any anomalous behavior until the final result of RPC-031. After an indistinct period of time has passed, the victim will enter a violent seizure where their head and limbs shake dramatically until their body stills and they enter a short comatose period before their vitals fail. Autopsy reports reveal the subject's lungs to be filled to bursting with standard office paper and water-glycol composition black printer ink. The cranium has been observed to be compacted with large quantities of exact replicas of RPC-031-1 resulting in severe brain trauma and cranial fractures. Despite the original document being intact, any former areas where living beings were present will now appear as nothing but blank white spots on the material used. Initial discovery and retrieval: RPC-031 was recovered from an office of [REDACTED] located within the city of ████████ in the Midwestern United States. 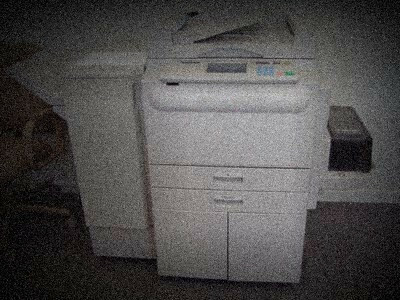 The object was discovered after reports of an employee attempting to print a family photo with RPC-031. All casualties have been scrubbed as car accidents and high-grade amnesiacs have been given to all coworkers. Addendum: Previous owners, (deceased.) have described in Authority secured documents their attempts to dismantle RPC-031. After opening the case they discovered nothing within that showed any unique properties aside from a single metal plate located on the top side of the ink cartridge slots showing as of now ineligible scratches and symbols, said cartridges themselves have never been found to contain any amount of printer ink. Any parts removed or damaged will eventually reappear within the chassis once leaving observation.